A good number of buyers give the Nike Air Max Infuriate Low a high satisfaction rating. Several declare that the shoe is fashionable and works with any outfit. These Nike basketball shoes have excellent traction according to most testers. The Air Max Infuriate Low is comfortable to wear, some claim. They say that the overall fit is perfect. A couple of wearers note that the shoes feel light and provide great support. Many purchasers love these highly recommended basketball sneakers. They agree that the Infuriate Low is a great budget model from Nike. 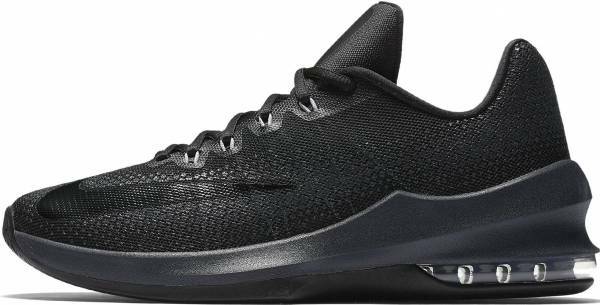 Several complain that the Nike Air Max Infuriate Low runs very tight at the forefoot. More than a handful of buyers are forced to return these Nike shoes because of its uncomfortable fit. One user claims that these Nike basketball sneakers run small and are hard to put on. Nike just showed us that it is possible to produce budget basketball shoes that don’t sacrifice quality. The Air Max Infuriate Low outperforms most expensive performance shoes. It even does more than most signature sneakers (including the KD 11 and Air Jordan 33) currently available. Despite its narrow fit, the shoe excels in nearly all categories. All in all, the Nike Air Max Infuriate Low is an excellent budget model. It's an all-around shoe that any player will enjoy. The Air Max Infuriate is a shoe for ANY player — small, quick guards, small forwards who fly, and traction whores. It does what a lot of more expensive shoes don’t do, and it does that at a margin of the usual cost. Make your opponents mad by executing pinpoint stutter steps and swerving past defenders; it’s time to take your game to new heights with the Nike Air Max Infuriate Low. Designed for fast and dynamic play, the Air Max Infuriate Low offers lightweight stability and containment with plush cushioning and a classic Air Max style. Cushion. The Nike Air Max Infuriate Low features a Phylon midsole with Air Max in the heel for lightweight cushioning. The Phylon foam midsole delivers cushioning for a stable ride and offers support during hard landings. In the heel, a full 180-degree Air Max unit responds to lateral movements on the fly and helps cushion impact. Traction. The shoes have a durable rubber outsole with multidirectional herringbone traction pattern that allows for an excellent grip on a variety of surfaces. Length and Width. The Nike Air Max Infuriate Low runs true to size but is reportedly very narrow at the forefoot. Wide-footers are advised to try the shoes in-store first. Lockdown. The shoes feature Flywire cables that integrate with the lacing system for dynamic lockdown and support. The cables wrap the foot; providing a snug fit. A high cut U-throat base around the ankle improves motion and helps distribute force throughout the shoe. The Flywire cables and high U-throat construction combine for a better lockdown. The Nike Air Max Infuriate Low features a mesh upper for breathable and lightweight comfort. On the upper, a unique screen-printed design uses high-abrasion ink for a protective coating. The shoe’s low-cut style is reminiscent of past Nike Basketball models. Its midsole is similar to that of the Nike LeBron 13 Low. However, bold lines lead into a 180-degree Air Max unit in the heel. The Nike Air Max Infuriate Low’s mesh upper is finished with screen-printed graphics and a large Swoosh at the tongue, another detail similar to the LeBron signature line.